Hey Everybody! It's the second Thursday of the month here in California, USA and if you follow my blog then you know what that means... OSAT blog hop time! This month we have such a fun theme to work with- Throwback Thursday! We're all digging back into our old cards and projects and recreating some of them with new products. You may also see some Throwbacks to retired product and to some really old school hair styles! Be sure to click the next button at the bottom of my post to continue on with the hop. And, here are the old, "throwback" projects that I used for inspiration. I couldn't decided if I wanted to case the Dragonfly notebook on the left, or, if I wanted to use the layout from the two cards on the right. So, I ended up doing both. 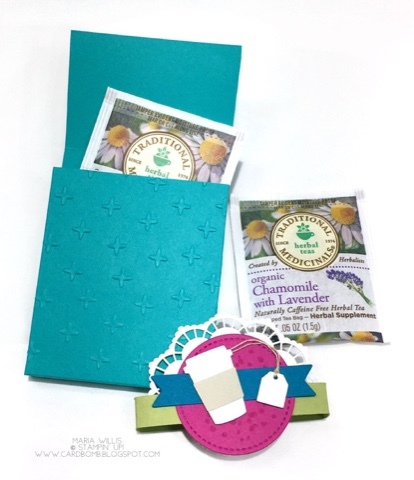 I used the same products, colors and techniques as I did on the notebook and combined all of that with the layout from the cards. 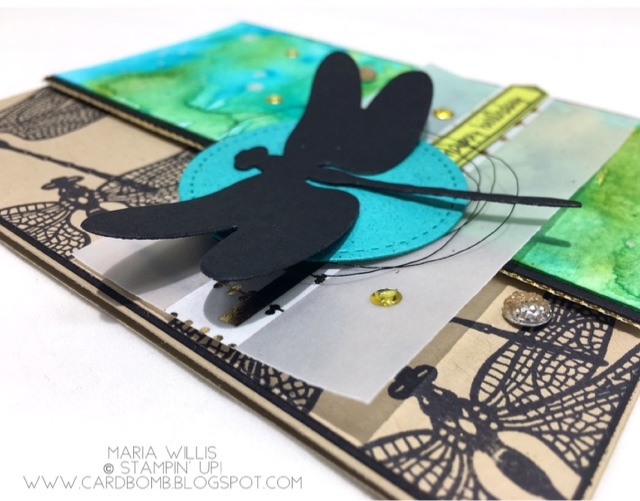 Side note: The Bee card is actually an example of me CASE-ing myself earlier this year so why not add one more project with this fun layout? 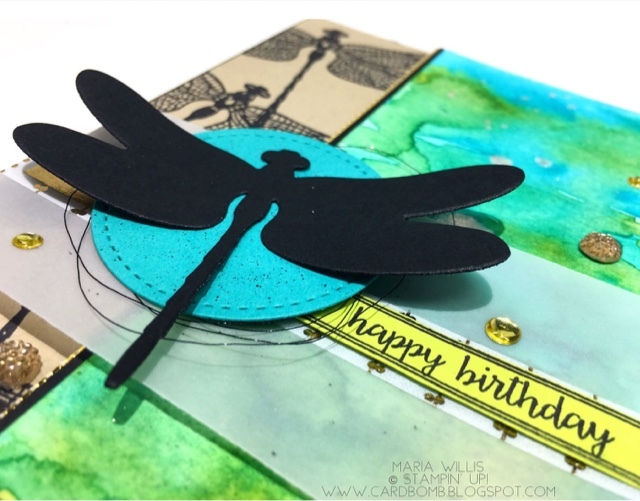 The top layer of the card is a dragonfly in Basic Black. I curled its' wings up a bit to give it dimension so that it looked ready to fly off of the card. Under that is a stitched circle in Tempting Turquoise and splattered with a Basic Black marker. Beneath that are layers of Black Metallic Thread, a sentiment on Lemon Lime Twist, washi tape, and vellum. The water color layer was painted with Old Olive, Bermuda Bay and Tempting Turquoise and then flecked with Clear Wink of Stella. The water color layer was matted on Basic Black and if you look closely you will see a bit of gold peeking out from the edge. That's a strip of the Gold Metallic Edge ribbon and I thought it was a fun way to add both texture and a metallic look to this card. 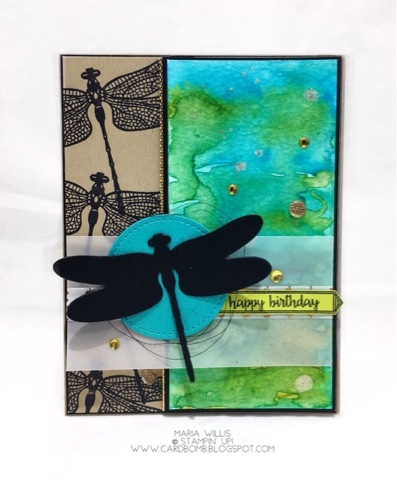 The background is Crumbcake stamped with Basic Black (Archival) dragonflies. I added some gold enamel shapes and Faceted gold Gems on top to tie this whole thing together (Thanks for the idea Sara!). My project today isn't actually a throwback to another project... It's a throwback to that one time when I was making this project and then left it sitting in a pile of pieces for two months... I'm serious. I do that all the time. I'll start making something, get distracted by some other fun thing or idea and I never come back to what I was working on. Well, this time I decided to come back and finish this pretty little tea box. I'm glad I did because it will make a fun gift for someone. Before putting the box together I dry embossed part of the Bermuda Bay box with the Sparkle embossing folder so that the bottom of the front panel would have texture. The front flap that folds down and is held in place by the belly band is smooth as I did not emboss that part. I was excited to use these little "Coffee Cups" dies for tea cups because if you give me the choice between tea or coffee... I'm a tea drinker hands down. 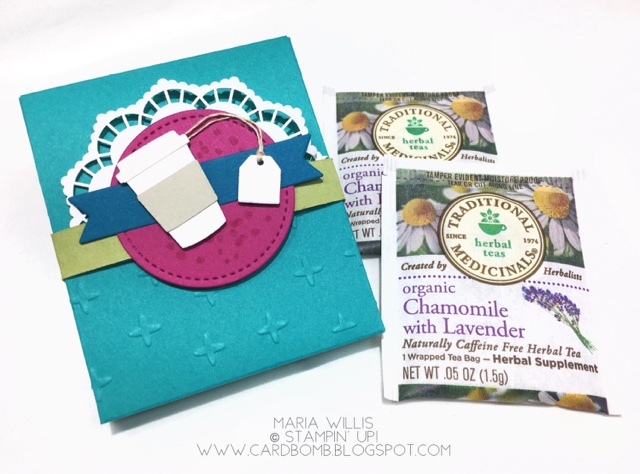 I used the dies to cut out two cups and the tea tag in Shimmery white paper. I cut one more cup in Sahara Sand. I cut the lid off of one of the shimmery cups and adhered it to the top of the cup with my fine tip glue pen. Then I cut the "wrapper" out of the center of the Sahara Sand cup and added that to my shimmery cup as well. I like the layered look of the cup as it seems a bit more realistic than leaving it one dimensional. I used linen thread (I had to unravel it and use just one thread bc it was too thick) and a glue dot to connect my tea tag to my tea cup. I decided to leave the tag unstamped and keep my project clean and simple. Then I layered the cup and tag onto a Dapper Denim banner from the Bunch of Banners dies and put that on a Berry Burst Stitched Circle. All of that adhered to an Old Olive belly band backed with a retired doily. The tea box fits 2-3 bags of tea depending on what kind of tea you use. The belly band slips on and off easily. If you want directions for this box please let me know. I wrote the measurements down somewhere when I started this project two months ago. I'm sure I could find them and make a quick video if you all are interested. Ok, that is it for today folks! Thank you so much for stopping by- it always makes my day to have you here! If you have any questions about my projects or need help purchasing the products to make your own please let me know by commenting below or shooting me an email at: mariawillis@hotmail.com You can also click the "Shop Online" button below. For more epic Throwback Thursday inspiration head on over to Melissa Davies. Enjoy! Melissa Davies:NEXT UP ON THE HOP! So beautiful! The watercolored background is so colorful and just the perfect addition to the crumbcake and black. Love your little teabag box too.. super cute! Awww, thanks for the shout out! 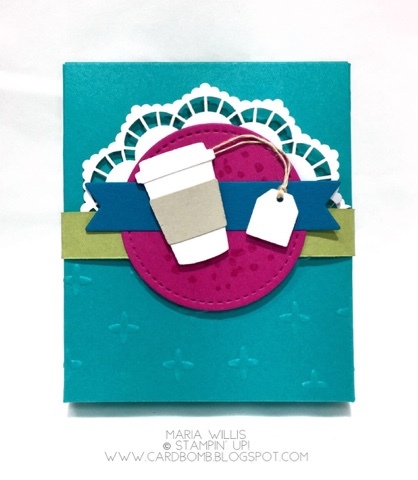 I just love the card -- it's a great mixture of texture and color. The tea bag holder is just adorable. I'm with you -- I'll take tea over coffee any day of the week! You know it! Thanks for the great idea! Tea lovers all day! Tea drinkers unite!! Love the tea holder - am interested in the directions! Thanks for sharing! Yes, tea drinkers unite!! I will try to get a tutorial done within the week... at least for the box. Thank you! Cute projects. I really like the tea holder. I'm a tea drinker myself and love to gift teas. This is a great idea. Thanks for sharing. Thanks Renee! I like gifting teas too. So glad you liked it. Thanks Kareth! I've got to find those measurements wherever I left them (face palm for misplacing them)... but as soon as I find them there will certainly be a tutorial. Fantastic update, Maria! Thanks for sharing.